Every year when Mia's birthday starts approaching I let her pick the theme that she would like her birthday party to be. She has chosen themes such as Disney Princesses for her 3rd birthday and a Carnival theme for her 5th birthday. This year for her 6th birthday she chose an Art themed party. While searching for decorations for her party I quickly learned that it isn't a very popular theme, so much of her party would need to be DIY. While I was searching for art party themed items I came across the Shindigz website. Their website has products that are perfect for pretty much any party: birthday parties, baby showers, graduations, Shindigz has it all. I found items that complimented the DIY decor that I had planned perfectly! To make the party a bit more personalized I ordered a personalized art themed birthday banner, bottle labels, and cupcake wrappers. I was so impressed with the personalized banner. For the price of $14.99 for the 18"x54"size, I was expecting the quality to be decent but nothing special. As soon as I opened it I was immediately impressed. I kept commenting to everyone at how amazing the quality of the banner is for the price! I also found rainbow dinner plates, dessert plates, and napkins, and Mia chose yellow cups to accent the other decorations! I also ordered two white paper lanterns and planned to find a fun way to make them work with our theme. Once we were done shopping on the Shindigz website I knew that this party was finally coming together and couldn't wait to see the end results! I happen to have an incredibly talented and artistic younger cousin who made my DIY planning a hundred times easier than it would have been without him! 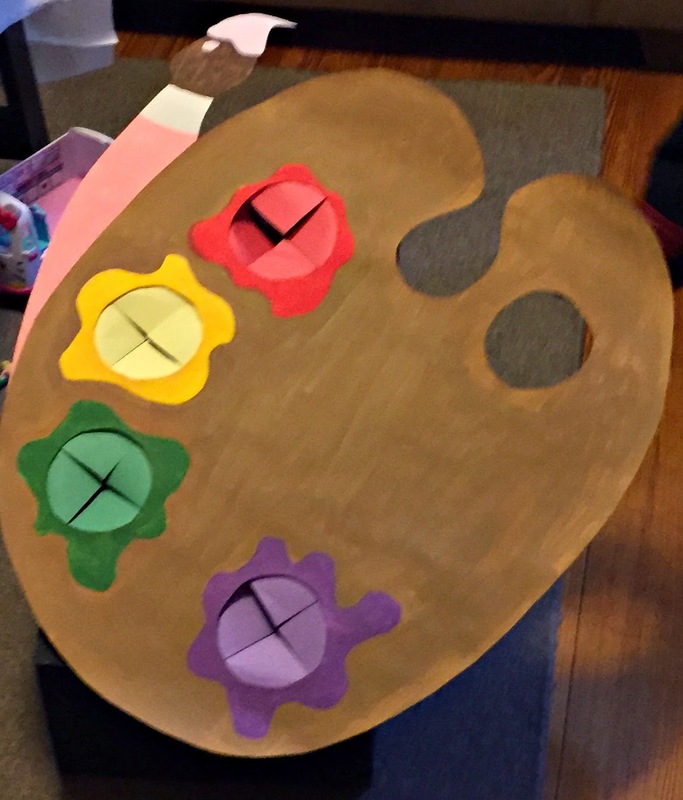 He painted a paint palette, paint brush, and a variety of crayons for me on poster board that we cut out and used to hang throughout my house. We also cut out paint splatters from solid colored scrapbook paper. I was originally going to use crepe paper streamers to decorate along the ledges that I have in my living and dining rooms but then I thought of paper chains and decided that they would be a great addition and pop of color! I made the paper chains from the same colored scrapbook paper that we used for the paint splatters. I think that every year from now on I am going to use paper chains of various colors instead of streamers! I absolutely love the fun touch that it added to the party! The paper lanterns that we ordered from Shindigz ended up being a perfect addition to our decorations! We took round sponge tipped brushes and dipped them into paint. We then dabbed them onto the lanterns. The paint dried very quickly and were ready to hang up! They were a colorful way to bring two rooms or decorations together since I hung them in the doorway! I always admire water bottle labels but never end up ordering them because I find them to be a bit overpriced or tacky. As soon as I saw the art themed ones from Shindigz I knew that I had to had them! These art themed labels are only 49 cents for each one and add a pop of color and personalization to your drink table. They were so easy to put onto the water bottles and everyone kept commenting on how nice they looked. Most years at Mia's birthday party I have the children who attend decorate cupcakes, so was planning for that this year as well. 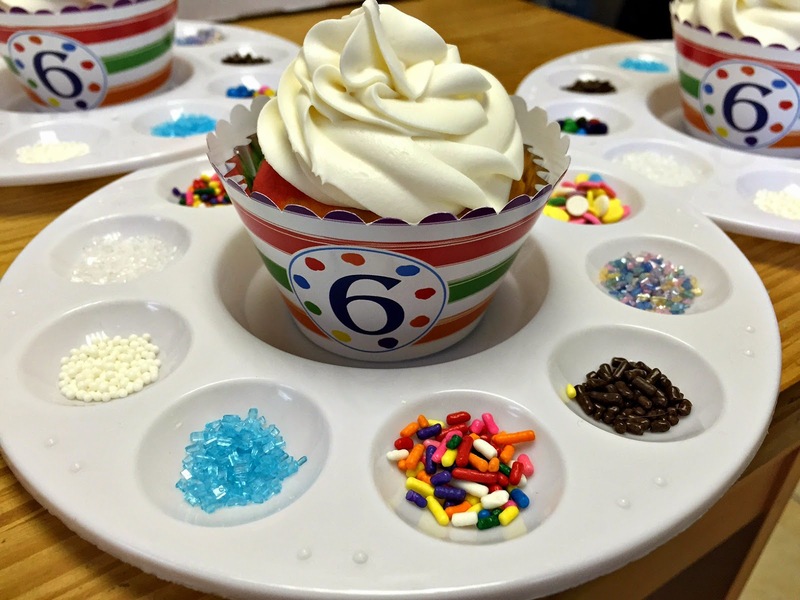 once I received the cupcake wrappers from Shindigz I immediately had the idea to use a small paint palette for the cupcakes and the sprinkles that I would be handing out to the children. The personalized cupcake wrappers were only 50 cents each and added color to the paint palette to make the cupcakes really stand out! All of the kids had so much fun with this activity! While I was searching for art themed birthday party activities I realized that there weren't really any games to purchase so we had to come up with our own. I took some time to brainstorm a few ideas and my cousin who I mentioned earlier was able to bring them all to life for me. The first that he designed was pin the paintbrush on the painter! 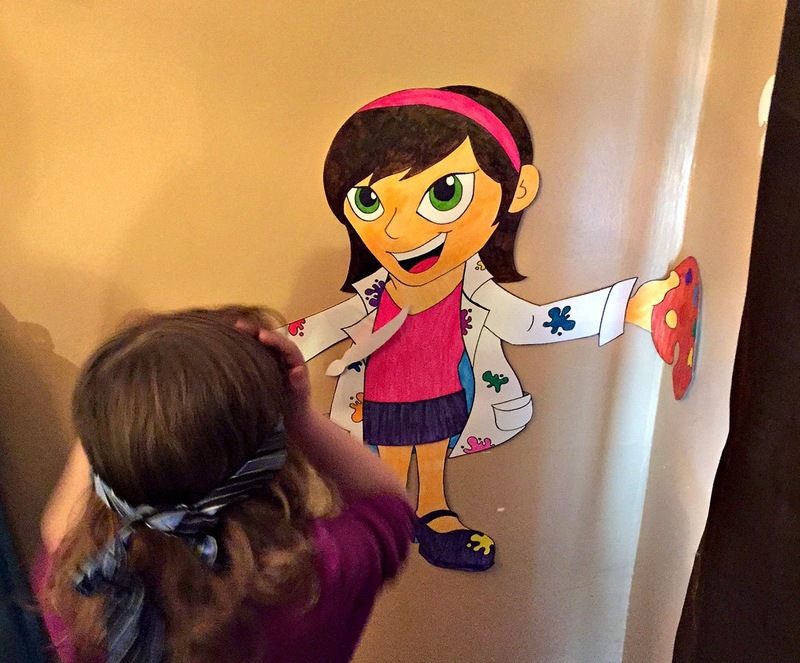 He drew and designed her with marker on poster board, and created small paintbrushes for the children to pin on to her. The second idea that I came up with and my cousin designed was a ball toss game. He used a cardboard box, poster board, and construction paper to assemble this game. First he took a box and cut it on a diagonal so that he could attach the palette he painted to it. He also cut a hole in the back of the box in order to get the balls out of the box after the children took a turn. Once he had the palette painted and the holes cut to size he attached construction paper to each hole so and cut an X in it so that you weren't able to see into the inside of the box. He then attached cardboard to the back of it make the palette a bit sturdier and then attached the palette to the box. It was a bit of work but the kids absolutely loved playing it! 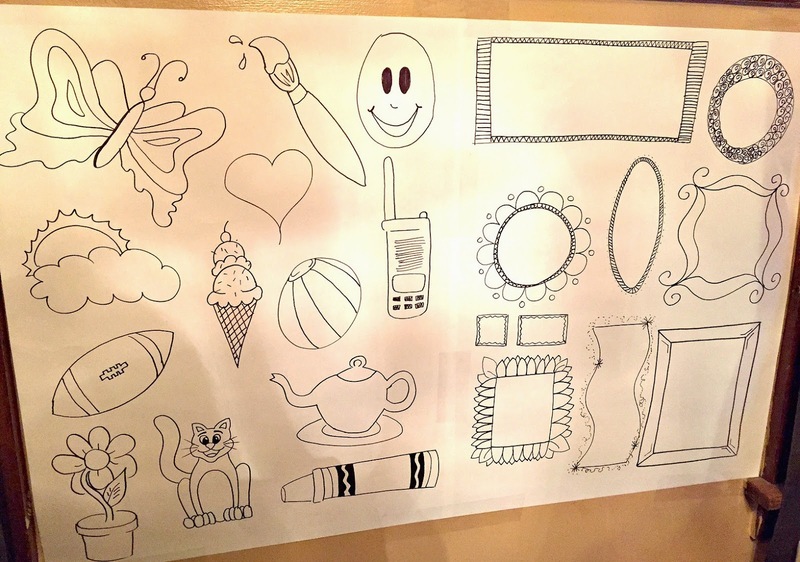 To create another fun activity for the kids my cousin also created some things for the kids to color. On one poster board he drew some basic designs that the kids could color in. On a second poster board he drew frames for the kids to fill with their own drawings. Once he was done I hung them up and put some crayons nearby for the children to color in. 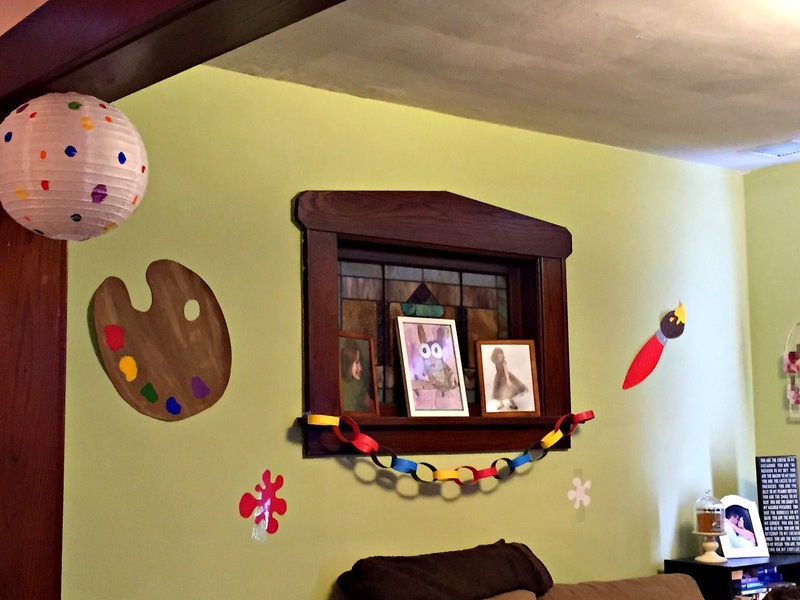 They were a great addition to the decor and a fun activity to keep the kids busy! If you love this idea but are like me and not very artistic you could always print out printables and attach them to a poster board! All in all I think that Mia's Art themed birthday party turned out wonderfully! She had an amazing day, everyone loved her decorations, and it was so much fun to put together and plan! I am so glad that we found Shindigz because their items complimented our art theme perfectly! If you are planning a party be sure to visit their website HERE!